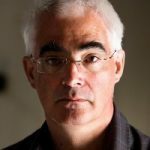 Alistair Darling was Chancellor of the Exchequer during the worst financial crisis of modern times. He was credited as a steady hand in helping to save he UK banking system and with playing a significant role in stabilising financial markets to avoid the bankruptcy of the international banking system. As a law graduate from the University of Aberdeen originally worked as a solicitor in Edinburgh before being called to the Scottish Bar; he entered politics in the 1987 general election, challenging and unseating the incumbent conservative MP by 2,262 votes. He is one of only 3 people have served continuously in the 13 years of Labour cabinets from 1997 to 2010. He was Chief Secretary to the Treasury in Tony Blair’s first cabinet, moving to work and pensions, and then taking responsibility for the Scotland Office and the Department of Transport and then Trade and Industry before settling in the Treasury. As Chancellor, Alistair was widely credited by some with preventing recession from spiralling into a repeat of the Great Depression. By the time he left office he was able to claim that government borrowing had been reduced below forecast, and that unemployment and repossessions were lower than had been anticipated. After 28 in years in parliament he went on to lead the ‘Better Together’ campaign to keep Scotland as part of the UK. In 2011 reflecting on his time in office he published his memoirs Back from the Brink: 1000 Days at Number 11. In this he discusses the inner workings of the government and the Labour Party under the leadership of Gordon Brown. He also describes the financial crisis and his response, actions and outcomes. Rt. Hon Alistair Darling is a sought after keynote speaker. His breadth of knowledge and experience make him unlike any other. He is able to give first hand perspectives and intriguing anecdotes of not only his recent past, but also his expert perspective on possible futures of the economy and on current affairs.